Time to start your own GT4 privateer racing team? 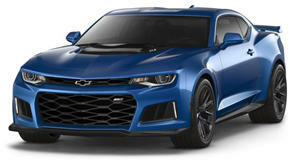 Last spring, Chevrolet announced its race-ready, factory-built Camaro GT4.R. Based on the already mental Camaro ZL1 LE, the Camaro GT4.R was developed by Pratt & Miller Engineering, the very same group that builds Chevy’s Le Mans Corvette C7.Rs. Like the ZL1 LE, the GT4.R is powered by a supercharged 6.2-liter V8. And now it’s being made available to all privateer GT4 racing teams. The price is $259,000 per car. Two race teams have already bought GT4.Rs, competing and winning races in the 2017 Pirelli World Challenge GTS Drivers, Manufacturers, and Team championships, as well as the 2017 IMSA Continental Tire SportsCar Challenge Series. With a minimum weight of 3,131 pounds, the Camaro GT4.R’s aerodynamics have all been developed and tested on a full-scale rolling road and wind tunnel. Its V8 features direct-injection, custom carbon fiber intake, custom camshaft, and a customized Bosch Motorsport MS6 ECU. All told, the GT.R can be tuned up to 480 hp (the street-legal ZL1 LE has 650 hp). The racer also features many body accessories, specifically wider front fenders, hood extractor, aerodynamic side skirts, and carbon fiber doors and front fascia. There is also a carbon fiber rear spoiler, front dive planes and carbon fiber front splitter, all of which are GT4-spec. The Camaro GT4.R rides on a set of 18-inch Forgeline one-piece forged alloys wheels front and rear. There’s also Brembo Motorsport six-piston front brake calipers, Brembo four-piston rear calipers, and custom adjustable front and rear antiroll bars. So, anyone looking to start a new GT4 racing team? Any existing teams looking for a new chariot? Chevrolet will be more than happy to sell you this one.